Auteur(s) : Pearson Allen, John; Quinlan, Brian J. Estate Planning Handbook, 5th Edition is a highly practical text providing an overview of estate planning. 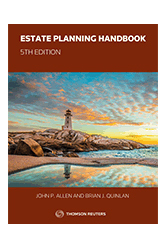 Estate Planning Handbook, 5th Edition is a highly practical text providing an overview of estate planning. This work focuses on the tools of estate planning and general planning considerations. It also provides annotated precedent materials essential to estate planners. Ontario Law Reform Commission recommendations on Legal Capacity, Decision-making and Guardianship have been added to Chapter 2, The Continuing Power of Attorney for Property. References to Medical Assistance In Dying (MAID) are now part of Chapter 3, Power of Attorney for Personal Care. Samples of contract wording have been included in Chapter 5, Contracts. Chapter 8, Estate Administration, incorporates discussion on Re Milneand Re Panda to the Two Wills section. Chapter 11, Taxes and the Death of the Taxpayer, has updated the U.S. estate tax information. The new rules for the taxation of trusts and estates have been incorporated into Chapter 14, The Taxation of Trusts and Trust Beneficiaries. Chapter 18, The Vulnerable Client, has been added. 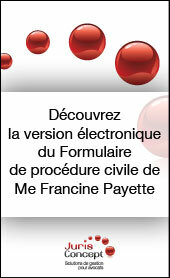 106 internautes ont consulté cette page.